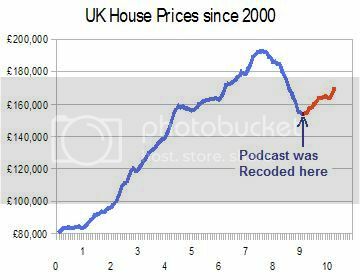 GPC UK Data bank / & "Bull Trap podcast"
The 4.Apr.2009 podcast called for a 12 months "bounce" in property prices - & we saw that! They whisper their messages to those who can decipher them, as we have done on GEI. BDEV has given us excellent early warnings of TURNS in UK house prices. When? : 18th? - 18-20th : - 25 - 30th chg / -28th ? : Next mo.on 8th? *Actual figure Hometrack index; others are calculated from mom changes. FORECASTS for the US Property Cycle. Centex / CTX merged with Pulte / PHM - and so I am watching PHM now as my US bellwether stock. How did that forecast of a 2012 Low work out? The Low in PHM came in about one year early. BDEV, and other Builders have given us many excellent early warnings of TURNS in UK house prices. My predictions go back to 2006, when I started this website, and even before that. In fact, I started making predictions in 2004 (or earlier) on HousepriceCrash.co.uk ("HPC"). From the beginning, I had a Bearish bias, but I studiously watched the share prices of the UK Builders for clues of market turns. Back then, I developed a tool, an index of five Builders' share prices (the "combi-5" index.) The idea was that I could use "Real time" data from share prices, to make predictions of turning points in UK house prices, employing the same techniques of technical analysis that I used in trading stocks. The big advantage was that I would not have to wait weeks of months for an Index figure to be released. My historical research also suggested that the Builders index would turn earlier, giving an early warning of 6 -12 months ahead of when the Index figures turned lower. I had observed this Earlier Turn phenomenon in various markets, including Hong Kong, the USA, and the UK. Here's a chart from 2011, showing how my bellwether index preceded the downturn in UK Housing indicies. The chart above was produced by a UK website ( http://HousePrices.uk.net ) which employed the techniques that I developed and explained on various HPC threads, now sadly deleted. The five builders included: Taylor Woodrow, Barratt Developments, Persimmon, Wilson Bowden, and Balfour Beatty. Due to mergers and stock splits, it became increasingly difficult to keep the index consistent, so I eventually switched using mainly Barratt (symbol: BDEV.L) as my principal bellwether. The "Haliwide" Index (which is the average of Halifax and nationwide), fell 20.3% over 18 months, or an average of about 1% per month. Based on Elliott Wave patterns, I expected the entire correction to proceed as a Zigzag, with a rally and then a second low years later. So I was prepared for the rally to come when few were expecting it*, but I doubted whether many could make much money buying property near the first low. Nevertheless, I thought that the big drop in interest rates engineered by the BofE would be enough generate a healthy, multi-month rally. USING BDEV to Forecast House Prices in the 2009-13 "Range Trading phase"
From major double LOWS in 2008 (July at 22p, and Nov at 43p), Barratt/BDEV had a long A-B-C rally into a Sept. 2009 high at 280p. At a key point in the rally, I noticed that BDEV's price suddenly shot up in late March 2009, and broke a downtrend. So in early April 2009, I predicted a 12 months "Dead Cat bounce" in UK property prices. (Want to hear that forecast? 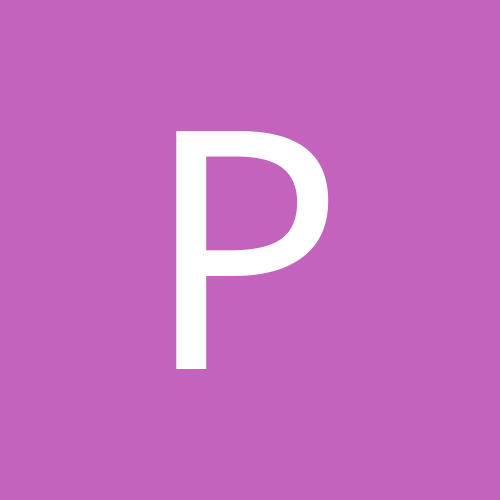 There's a link to a Apr.4th, 2009 podcast - LINK - that you can still listen to, while looking at the Charts I described: CHART LINK.) Today, with perfect hindsight we can see a major low was made in HaliWide prices at £153,477 in Feb. and £154,066 in March 2009 - but those March figures were not available until mid-April - so my early April 2009 podcast was both early and accurate. The rally I expected in 2009 duly arrived as buyers responded to the BofE's near-Zero Interest Rate Policy. I did not think that the downwards correction was over after just a 2-year drop: I suggested watching BDEV for a sign that the 2009 house price rally would peter out. From Sept. 2009 and its 280p peak (=184p, on a split-adjusted basis), BDEV began to fall. This drop in the share preceded a fall in actual house prices, as measured by various property indices. A key point in the decline, was when BDEV slid back below its 252 day/1 year moving average. That occurred in Feb 2010 (in a chart better adjusted for the rights issue - different than the one shown above.) I correctly anticipated that the confirmed break of BDEV's 1yr-MA would signal a renewed drop in UK Houseprices. Within a few weeks, in Spring 2010 a second downleg in UK property prices began. And it was clearly reflected in the HaliWide / H&Nindex (the average of the non-seassonally adjusted Halifax & Nationwide indicies), which peaked in April 2010 at £169,287. The new downwards drift in UK prices came despite continued ultra-low interest rates. But prices only fell by £7,946 (-4.7%) to £161,341 in seasonal low of Jan. 2011. BDEV slid lower for most of 2010, but the rate of decline slowed and the stock bottomed in late Nov.2010 at near 71p, which was well above the Nov 2009 low of 31p. Then, a year-end rally in BDEV stock began, taking BDEV back near 90p by the end of 2010. We watched to see if the bounce in BDEV and other UK builder stocks was going to be strong enough to push back above the 252d/1 year MA near 100p, thinking if that occurred, it should signal a reversal the downturn drift in UK property prices. BDEV rose above 110p, pushing beyond the 252d MA, suggesting that Spring 2011 would bring "upwards bounce" UK-wide home prices. But the action was unconvincing, despite the upwards trend. 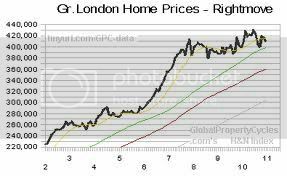 Early in 2011, I asked on GEI: "Will the UK house price rally last? I think not." The Homebuilder rally faded after the Spring of 2011, and BDEV rolled over at 120p and slid into the summer, as global stock markets suffered a correction. BDEV made a low of 65P in Aug. 2011. And following that pattern with several months lag, the UK Haliwide index peaked at £166,723 in July, and drifted down to a low of £160,554 in Jan. 2012. That was 5-months after the Low in Barratt's stock. In Q4-2011, the stock market pessimism was overdone. Global stock markets rallied, and that helped to propel a nice jump in BDEV, all the way up to 150p+ in March 2012. That was a 34% higher high than we saw in 2011. But so far, UK-wide Houseprices have lagged behind the levels seen in the prior year. Perhaps Barratt's share price is benefitting from its London focus, where house prices ARE hitting new highs. Even so, as I write this in July 2012, the stock remains in a clear long term downchannel, albeit it has risen to the top of that channel. BDEV has surged again after a Spring dip, rising to over 140p but remains below its 153p high. A drop in BDEV back below key support at/near 110p on high volume (If we see that), would be a sign that Crash Cruise Speed (with falls averaging more than 0.5% per month), is likely to resume in the housing markets. I expect we will see that after the London Olympics, when I expect realism to return to UK property markets. 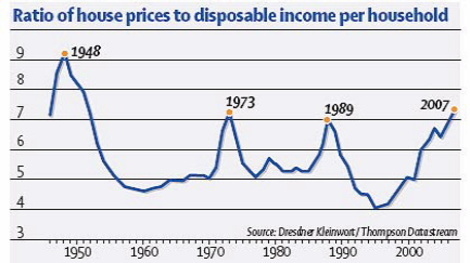 I still expect a serious slide in UK House prices into 2013 or later. Latest : In July 2010, On GEI I announced the UK Bull Trap rally was over. I saw this as the end of the "Dead Cat Bounce" that I previously forecast in early April 2009. I was expecting : A One year (or so) - "Dead Cat Bounce"
I was predicting a sizable rally in UK housing prices. But warned that Buying for the Long term might be potentially dangerous-to-one's wealth. People's wealth was hit by falling property in the US, and they stopped spending. The US will get over it before the UK. At April 2009 - 50% saw no bounce in the UK. Only 3 people (3%) said that the low was in place. People expected house prices would continue. Few people saw any signs to an upturn. Few saw that the Turn was already underway - most expected more falls ahead. How are you experiencing house price declines in your area of the UK? You should not use BDEV when using longer term charts because they diluted their shares massively last year you will recall. I would strongly suggest you use Persimmon, Taylor Wimpey and Berkeley Homes instead. Otherwise it undermines your argument. Just thought I'd offer that. Alongside this chart, you may want to look at cycles for more "granular" detail, especially with the "Builders as a bellwether"
I see you point, but BDEV was the best indicator up to that point, and was the one that I referred to in the 2009 Podcast. So into that way, I am stuck with it, if I am updating those discussions. I see you point, but BDEV was the best indicator up to that point, and was the one that I referred to in the 2009 Podcast. So into that way, I am stuck with it, if I am updating those discussions. Can you poss see if CC will allow it to be added to FBB so that it can be auto'd via itunes library? You will also get more hits I reckon. I actually think it is still more than valid - the dilution is "baked in the cake" and actually shows part of the "phase of max stress". If anything BDEV should have more "leverage" to sentiment having watered down their shares. Last week the Halifax reported the third consecutive monthly drop in house prices, which the lender's chief economist, Martin Ellis, said was largely in line with expectations. He, like many other commentators, expects prices to either flatline or fall by the end of the year. Personally i don't see any reason why we shouldn't be following the US into a prolonged 2nd round of house price falls... and soon. Funding for a government scheme that helps protect homeowners at risk of repossession is to be reduced, the housing minister announced today. That should get the bowels of the market shifting! The house we sold in Summer 2007 at £430k, has just gone back on the market for exactly the price we marketed it for back then at £450k. The buyer has incurred legal fees, stamp duty and made some improvements on the house, so he will probably be out of pocket unless he gets the asking price at £450k. It is a little frustrating because in the last 3 years I could have stayed in that house, and not rented; my rent is more than my mortgage was. If he gets in excess of £420k then I have made a big mistake selling in summer 2007. The reality is that the funds from my sale haven't made that much either for me to be able to stand up to my wife and say it has been worth living out of boxes for a few years!! If he gets in excess of £420k then I have made a big mistake selling in summer 2007. You made your decision to sell using the best information available at the time and you were probably right to do so. You couldn’t have known the scale of fiscal stimulus and the slashing of interest rates. Even the people who predicted interest rate falls have been surprised at the way they’ve been kept down while inflation is (and forecast to be) over the BofEs target. If I was you, I would forget about the old house. You cannot change the present situation and you probably cannot learn anything from it either. Instead, I would have a good review of my investment choices, pick out successes & failures and examine the reasons for success & failure. Judge whether success or failure will be realised on your existing investments. There’s a lot more to be gained from this exercise and it will help you going forwards. I’m someone will come along in a bit and mention the horrific crash that’s coming round the corner. The truth is it might not come for some time yet so you have to work hard and make your investments outperform housing whether HPI is positive or negative. I know what you mean - it has been similar for me too. There is no guarantee that they can get out in time however and the potential for a huge loss is still there. I'd be very happy in cash at the moment. Lucky I converted to A$ so I'm currently ahead on the exchange but if you want to see a real housing bubble come to Oz. The sword of Damocles is hanging over the market. Can you imagine the anxiety heavily indebted homeowners face. Better to sit in cash without the risk. My plan's to live in a 4WD camper on returning home... what I would pay in rent will pay the mobile home/ box off in a year or so. Thanks to HPC I, too, sold in 2007. Thanks to GEI, I bought gold (Goldmoney) with the proceeds and have more than doubled up. I am completing tomorrow on a slightly better house mortgage free. These comments are ridiculous ! The TRUTH is, IF you are going TO PANIC, you should PANIC EARLY, ahead of the crowd, and get a good price. Those who panicked back in Sept, or Octtober 2007 when prices began to fall did themselves a big favor. Those that hang on, see prices slide 15%, 20%, or more and, THEN PANIC, are going to regret it. I hope the reporter who wrote the article takes his own advice, so he can learn an important lesson. What does she think you should have done? Where did you guys store your wealth? You probably would have done better with more Gold, eh? (Me. too. BTW. That is: more gold, and fewer Gold shares would have served me better. Spent all the money on shoes, handbags and nice holidays. Worry about the future when it happens. Have you seen the Shoe & Handbag Index? It has fallen like a stone. Worse than that McMansion in Swansea's outer rim. Doesn't she acknowledge yet that the Jones are being steamrollered? If she lived in the US, she would. From a low in July 2008 (at 22p), Barratt/BDEV had a long rally into a Sept. 2009 high at 280p. We noticed a key point in the rally, and in early April 2009, predicted a 12 months "Dead Cat bounce" in UK property prices, and that duly arrived. We watched BDEV for a sign that the house price rally was petering out. And from Sept. 2009 and the 280p peak (184p, on a split-adjusted basis), BDEV began to fall. This drop in the share preceded a fall in actual house prices, as measured by various property indices. A key point in the decline, was when BDEV slid back below its 250 day/1 year moving average. That occurred in Feb 2010. Within a few weeks, in Spring 2010 a second downleg in UK property prices began. 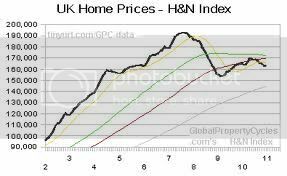 And it was clearly reflected in the H&Nindex (the average of the non-seassonally adjusted Halifax & Nationwide indicies), which peaked in April 2010 at £169,287. The new slide in UK prices came despite continued ultra-low interest rates. BDEV continued to fall for most of 2010, but the rate of decline slowed and the stock bottomed in late Nov.2010 at near 71p, which was well above the Nov 2009 low of 31p. Then, a year-end rally in BDEV stock began, taking BDEV back near 90p by the end of 2010. We watched to see if the bounce in stocks was going to be strong enough to push back above the 250d/1 year MA, and if that occurred, if there would be a reverse the downturn in UK property prices. In early 2011, Homebuilder prices rose further. BDEV rose above 110p, and pushed beyond the 250d MA, suggesting a Spring 2011 "PAUSE" in the decline in UK-wide home prices. Will the house price rally last? I think not. The failure of the Homebuilder rally and a drop in BDEV back below 100p on high volume (If we see that), would be a sign that Crash Cruise Speed (with falls averaging more than 0.5% per month), is likely to resume. I still expect a long slide in UK House prices into 2012/13 or later. Next Buy signal would be: after the Builder shares break up above key resistance levels on high volume. The present rally has broken above some important MA's, like 377d and 610d, but with light voliume. So we cannot take a 2011 decline for granted. But from a fundamental standpoint, I cannot see how UK houseprices will be able to overcome: a rising supply of homes on the market, the probability of rising rates, and the imposition of caps on housing benefits - all in an economic environment where post-tax disposable incomes are rising in tiny steps, if at all. Seems to be a common theme. I always tell my wife that we have no money and that we are bankrupt. But because she knows that I mean literally "no money" and not "no wealth", she just continues spending anyway. Well, I put about 20% of my STR funds into GM which wasn't enough as I left it too late and exited too early. I hold only about 10% right now but intend to spend more. 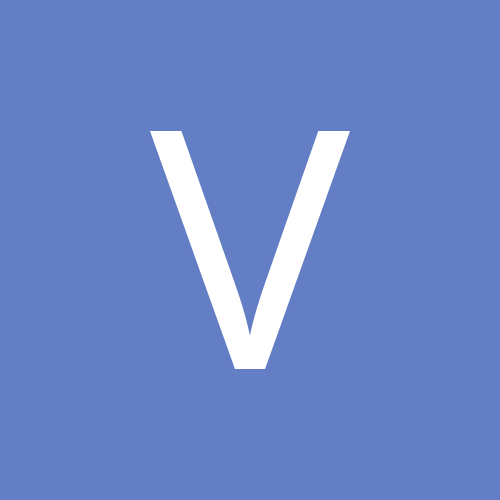 About 30% was loaned to my company from which we made more than 10% compound growth at least. The rest has been split in pathetic interest accounts and stocks the latter of which have been poor since 08. When you compare RPI and CPI at 3-6% it doesn't look that good. If my spheroids were made of metal I would have put the lot into gold. As it was I took a massive gamble with our families lives which right now looks about 50/50. I don't think I have lost as I feel liberated by not owning and can exploit markets when I choose. My gain in 3 years on investments, loans, PMs, equities and interest has averaged out at c. 7% of total capital overall. (After applying inflation this looks mediocre). But my rental during this period has been about £25k more than my mortgage was over 60 months. To cut a long story short, it all looks a little plain Jane doesn't it. Nothing to get too excited about. Has it been worth it - we'll see by next Spring. In the meantime if the damn EMs crash then the picture improves! My partner is frugal, and she knows I am "tight" with my spending often, too. require us to write cheques. And it is important to us both, to find ways, even creative ways, to do that. + A peak in the Rightmove Index (at 230,184 in October 2009), which was 6 months ahead of the peak in April 2010 in the Non-seasonally adjusted H&N-Index. + An April 2010 peak in the H&N-Index at £169,287, and that was 9.9% above the March 2009 Low of £154,066, and also 12.1% below the cyclical peak of £192,490 in August 2007. The rally retraced about 40% (15,221/38,424) of the 20.0% drop. All this figures suggest that my early April 2009 cal of a 6 to 12 months rally proved rather accurate - Listen to the Podcast for details.